Almora is famous for its exquisite temples, rich cultural heritage, unique handicrafts, lavish cuisine and magnificent wildlife Almora is a place full of fun and frolic. A rich medley of fairs and festivals of Almora beautifully predict the multihued lifestyle of the hills of U.P. This hilly district offers visitors a selection of treks, which combine the pleasures of sight seeing with the thrill of adventure. 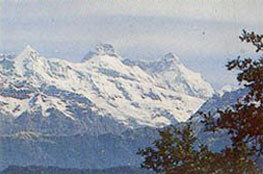 Almora is one of the three hill districts of Kumaon. The other two being Nainital and Pithoragarh. It is the cultural Capital of Kumaon. Almora is also referred to as the unspoilt child of nature. It is situated on a three-mile long horse saddle-shaped ridge and is surrounded by four hill ranges  Banari Devi, Kasar Devi, Shayahi Devi and Katarnal. The three peaks have temples of Goddesses while Katarnal has an ancient Sun temple worth visiting. April to June and September to November are the best seasons to visit Almora. In fact except the rainy seasons, Almora can be visited any time of the year. During summers, the temperature of this place is comparatively more than any other hill stations. Even then evening and morning temperatures are low enough to wear light warm clothes. The fun of walking among hills in warm sunlight can not be described in words. During winters festival of Dussehra has its own added attraction. Near Almora bus stand is the Govind Vallabh Pant Public Museum. This museum provides a deep insight of the development of art, culture, life style of this region. It has a very rich collection of items relating to Archaeological, Historic and cultural significance. This museum has unique collection of 'Apen', a folk style of painting. One can have a good view of the various aspects of this style painting. This museum is open from 10:30 in the morning to 4:30 in the evening. This ancient temple is one of the main attraction of Almora town. This temple is hundreds of year old and carries deep faith of many people from this area. The images and statues on walls of this temple are intricately and delicately carved. They are very attractive and almost true to life depiction has been done. Every year a fair, Nanda Devi Fair, is organized here. People from all over the place come and participate in this fair. Groups of young men & women dance on the pulsating music of the mountains. Two kms from Almora is situated Bright and Corner. This place became famous for excellent sight of sunset and sunrise. From Bright and Corner a different kind of view is obtained of dawn and dusk. The unusual calm and peacefulness during this time is rarely felt on any other hill station offering a similar view. Serene and calm circuit house very close to this point is an added attraction. Nearby is the Vivekanand library in Ramkrishna Kutir. In this library one can find many books relating to philosophy and spiritual thinking. There is also a place dedicated to Swami Vivekanand. It was at this place Vivekanand spent few days while his stay in Himalayas. Deer park is located some 3 kms from Almora. An evening stroll in Deer park has its own pleasure. The local people have much faith on this temple. The Chetai temple is located 8 kms from Almora. This temple is surrounded by dense fur and pine tree forest. If you are a nature lover then you will certainly enjoy this place. This is a picnic spot about 3 kms from Almora town. The whole place is covered with pine and fur trees. The calmness and peaceful environment has fun of its own kind. Jageshwar is located 34 kms from Almora. There is an ancient Shiva temple at Jageshwar. This temple is surrounded by huge fur trees. 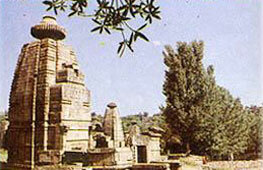 In fact, this temple is in the series of ancient temples which were built in Kumaon region many centuries ago. The Jageshwar Shiva temple carries archaeological importance too. The architecture of this temple is worth giving a close examination. Gannath is known for natural caves and ancient Shiva temples. This place is 47 kms from Almora. It is good place for nature lovers and ideal for spending your day with surpassing beauty. Every year on Kartik Purnima day a fair is organized here. From Kalimath one gets a good view of Almora town and the adjoining area. The sight of the nearby hills is amazing. This place is 4.5 kms from Almora. Close to Kalimath is Kasar Devi. There is temple dedicated to Kasar devi. This temple dates back to second century. One can go on foot from Kalimath to Kasardevi which is hardly 1 km from there. After the Sun temple at Konark in Orissa, Katarmal has the second important Sun temple in the country. This temple is almost 800 years old. But this temple has not received the amount of attention it must have received. Due to neglect, the Sun temple at Katarmal is in very bad shape. One feels very sad that a monument of such historical importance has been left to decay like this. This temple has some unique architectural style and the images carved on the walls are very intricately done. All this is bound to attract attention of the visitors. This place is 17 kms from Almora. This place has received its name from Lord Binsar Deo or Shiva. Binsar is 30 kms from Almora. The Shiva temple was built by the Chandravansi King Kalyan. This temple is built at a height of 2,412 meters. The peace and calm of Binsar provides peace of mind and soul. 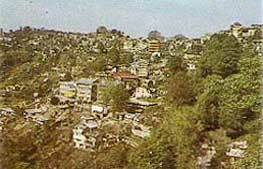 Bageshwar is the commercial town of Kumaon region. This town is some 90 kms from Almora. It is located along the River Saryu. There is temple dedicated to Lord Bagnath from which this place derives its name. This temple was built in 1450. A little away from Bageshwar is the Pindari Glacier. At Bageshwar one can get good accommodation facilities. Baijnath is a place of much historical importance. This is 71 kms from Almora and 21 kms from Bageshwar. There are many ancient temples at Baijnath. These temples have historical and archaeological importance. These temples have Shiva, Ganesha, Parvati as the presiding deities. Most of the temples are located along the Gomti River. These temples were built in 12th and 13th century by rulers of Katyur dynasty. This lovely place with gardens and forests is located 10 kms from Almora. Martola is so scenic and picturesque that many forgeiners decided to settle here. This place is a good picnic spot. Natural beauty of this place surpasses any other place. Koshi is 12 kms from Almora. The Govind Vallabh Pant Environment Research Institute is located here. There is a guest house which provides good and comfortable stay at Koshi. The picturesque old part of the town of Almora is the venue for the fair held twice a year. Jageshwar lying in the beautiful Jatganga Valley, housing one of the 12 jyotirlingas of India, is a complex of 12 temples in all. The Somnath Fair held on Vishuwat Sankranti day is celebrated in the Shiva Temple at Masi. The Devidhura Fair is held on the day of Raksha Bandhan in August, at the Varahi Devi Temple. The festival of Dussehra is celebrated with great pomp and show all over Kumaon. When one comes to Almora one does not forget to taste the sweets here which are quite famous. Particularly Singora and Bal Mithaiare liked by one and all. Apart from sweets, Almora is famous for Rabbit wool cloths. A special breed of Rabbit, Angora produces wool which is very soft, fine and very warm. Warm clothes made from this wool is famous all over the world. In Almora one can get good bargains at comparatively low prices. Then there are decorative items, brass items and other kind of metal utensils which are quite popular among the visitors. One can purchase woollen garments at reasonable rates from the Garud woollens. This shop is part of the Kumaon Schedule Tribe Development Corporation at Shikhar Hotel compound. For Bronze and Brass wares & decorative items one can have a look in shops at Lal Bazaar and Chowk Bazaar. Almora is a place that can be visited any time of the year, yet the summer season between the months of March to June is the best. Almora has got regular bus and taxi connections with Nanital, Ranikhet, Kathgodam and Kausani . Nearest railhead is Kathgodam (90 kms) & operating airport is Delhi (360 kms).